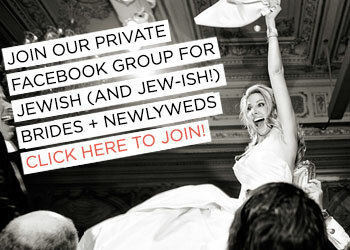 Nothing gives us the warm and fuzzies like hearing that we’ve helped a couple plan their Jewish (or Jew-ish!) wedding. 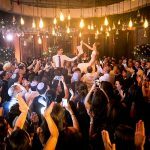 Especially when said wedding is as gorgeous as today’s knockout destination celebration with an absolute stunner of a rose chuppah – yup, that chuppah alone contained a whopping 1500(!) roses. 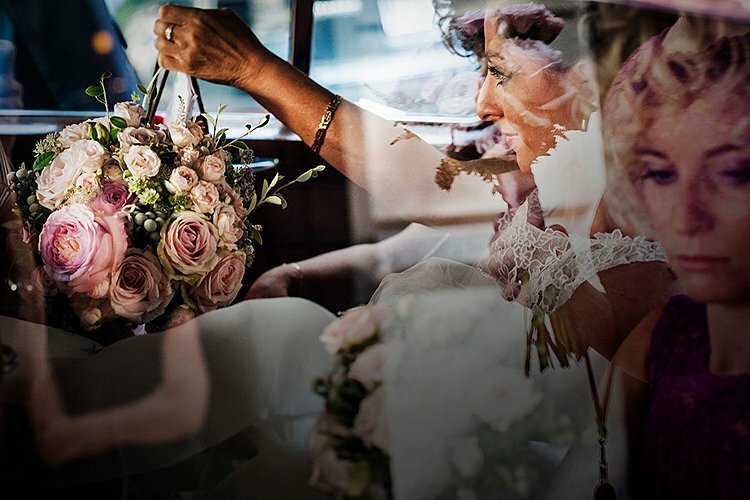 Deborah, a solicitor in a City firm, and Michael, who works in finance, live in North London, but they opted to marry in sunny Madrid, where the groom grew up (#margolovichwedding). 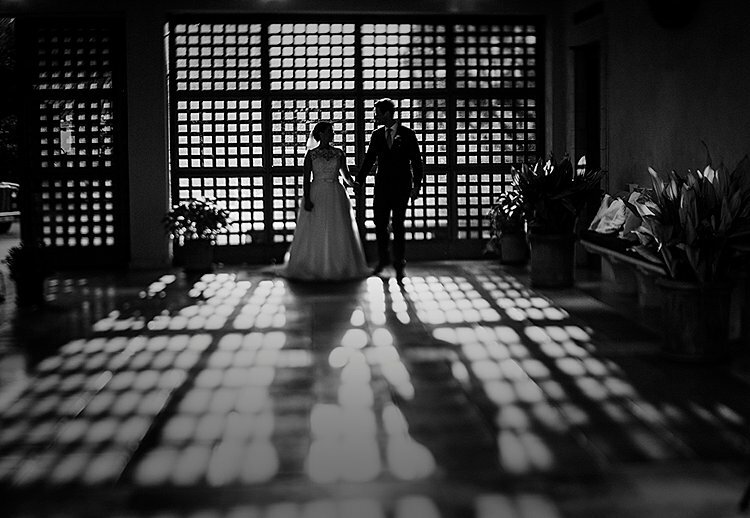 This is obviously a totally stunning wedding from a visual standpoint – Victor Lax’s emotion-filled photography and Al Agua’s moving trailer attest to that – but we’re seriously touched to hear that we inspired some of the emotional details of the day. 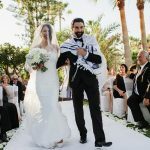 For instance, Deborah reports she got the idea to incorporate her late father’s tallit into the chuppah design right here on STG – such a beautiful way to incorporate a loved one into the ceremony. 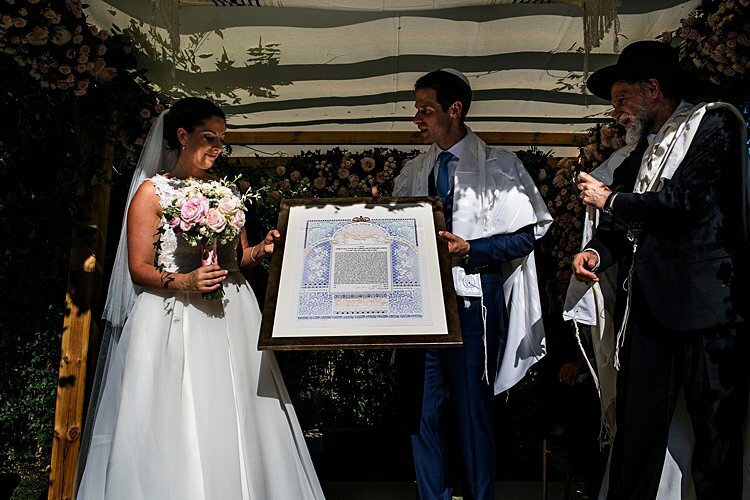 The couple also sourced their exquisite papercut ketubah from Smashing The Glass Recommended Vendor Danny Azoulay – featuring a gold ldea design of Jerusalem vineyards, in honor of their having met on Birthright in Jerusalem – aww! 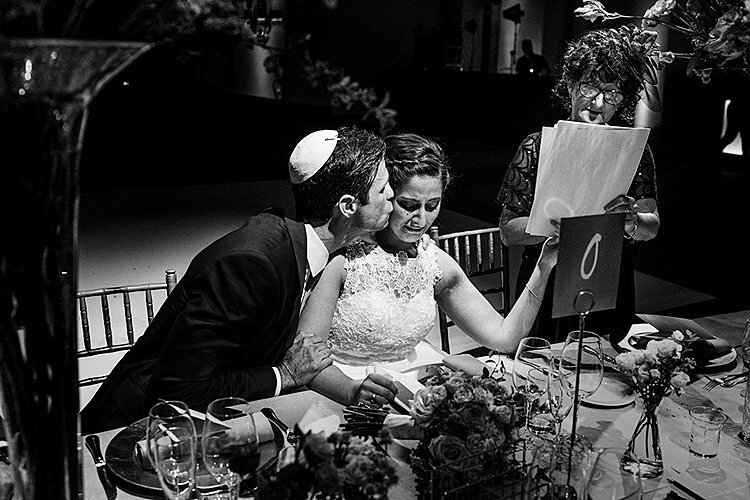 Deborah, the bride: We met ten years ago on Birthright in Jerusalem when we were both students and got engaged in November 2016 in Carmel-by-the-Sea, California, so this wedding has been a long time in the making! 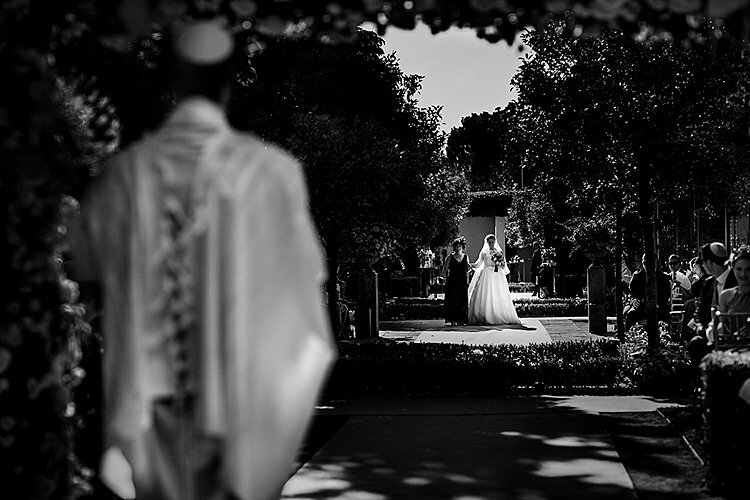 We held both the ceremony and the reception at La Quinta de Jarama, in Madrid. Michael was born and raised in Madrid and Deborah is from the UK (and we both live in North London). Deborah and Michael have spent a lot of time together in Madrid over the years. 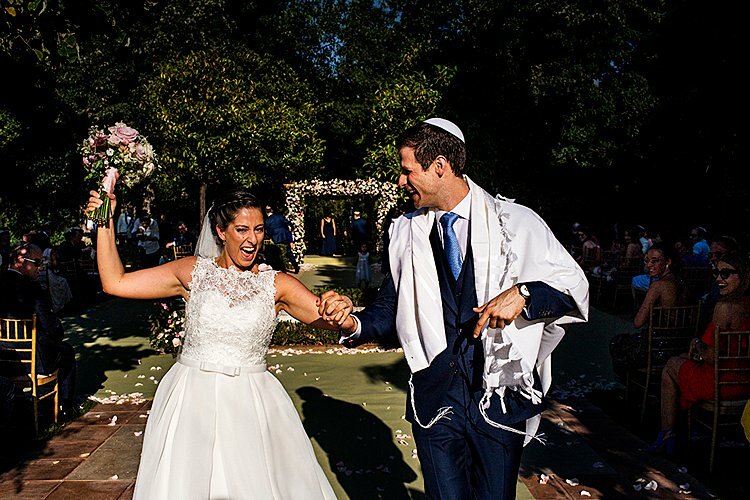 Our key requirements when looking at a venue was that we wanted somewhere that felt right for us, with relaxed modern setting, good kosher food and no curfew for the party (the latter was much easier to achieve in Madrid!). 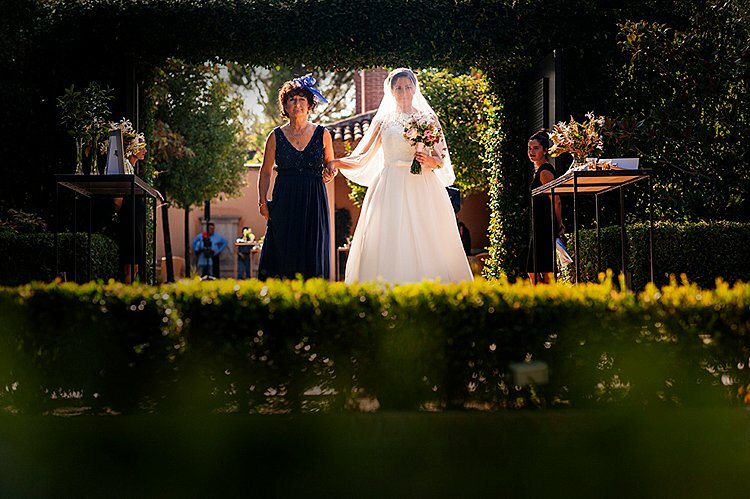 We looked at a number of wedding venues in Madrid and had actually attended a friend’s wedding at La Quinta de Jarama a few years before and were really impressed with the venue. La Quinta de Jarama were extremely professional and looked after every small detail for us. As you would expect, planning our wedding involved a number of trips between London and Madrid. The colours that ran through our wedding were raspberry pink and rose gold. 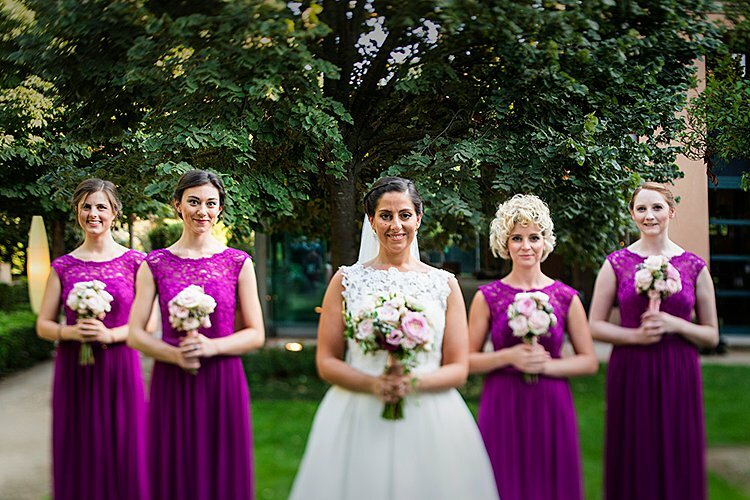 The bridesmaids’ dresses were raspberry pink (which worked really well with the bright Madrid summer day) and we had touches of the pink in the chuppah, bouquets and table centres. We also had some rose-gold details in the invitations and copper table decorations (i.e. the table signs and note holders). One of the key special points of our wedding was that a lot of our guests had travelled from overseas (the UK, Israel, Chile, Argentina) to be with us for this special day and we wanted to make the experience as personal as possible and to show our gratitude to them for going to such special efforts to be with us. 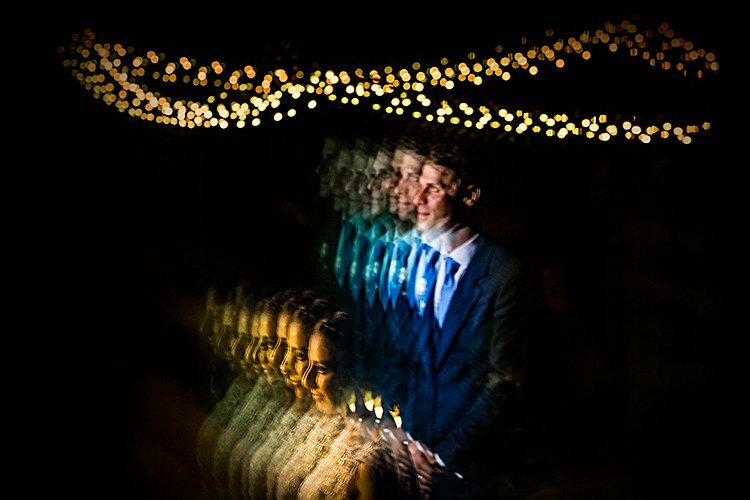 The high level of detail, personal touches and thought throughout our wedding was probably the thing that we got the most comments on from our guests. Having an “unplugged” ceremony so that our guests were with us in person. This was particularly important as our ceremony was very emotional and there were a lot of tears. As our wedding was in Madrid there weren’t many vendors on STG covering that area. 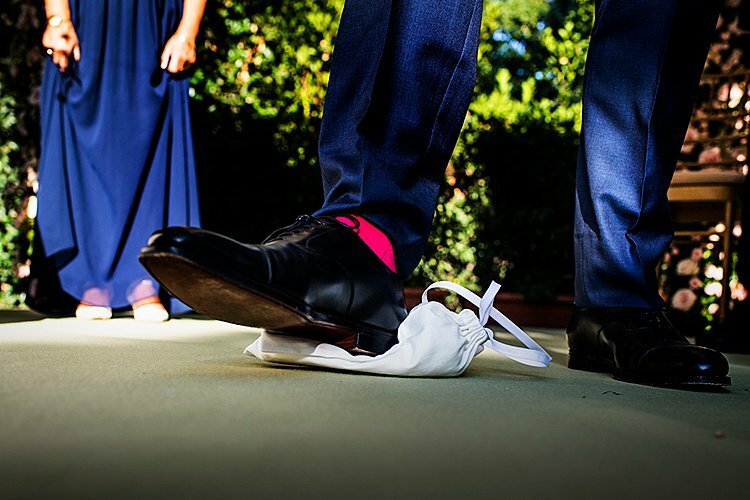 One of the reasons that we wanted to contribute to the STG blog was so that other couples could benefit from our research and experience of planning a wedding in Madrid. 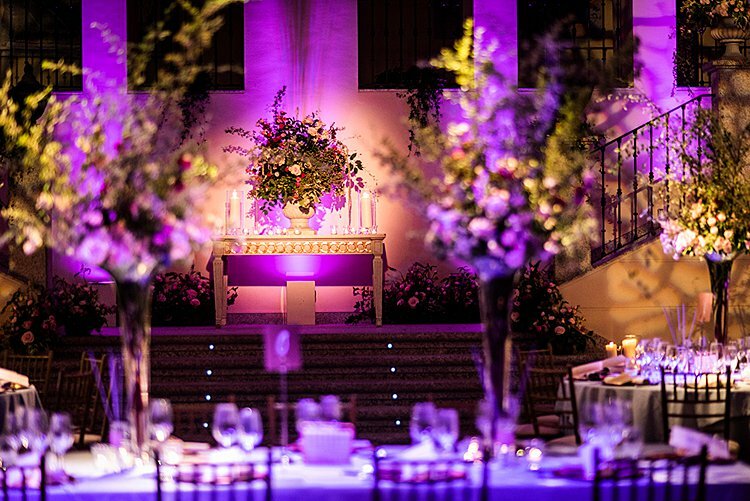 We did have a wedding planner, Eric Serfaty of Bosseto Eventos. 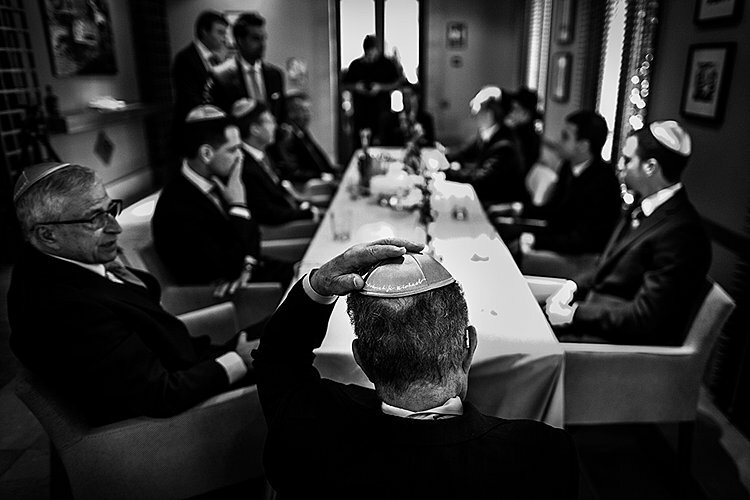 Eric is the “go to” man in Madrid and further afield in Spain for Jewish events and he is such a professional in terms of planning the event, the logistics and making sure everything runs smoothly on the night. Eric’s motto was “everything is possible”! 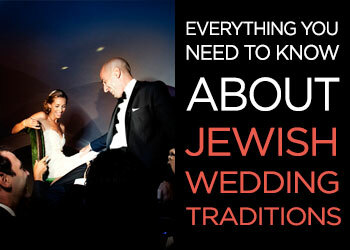 He was a great source of knowledge and practice suggestions, which are all key when planning a destination wedding! 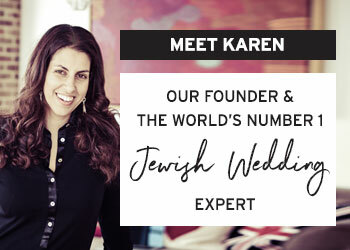 We worked closely with Deborah Cohen at Kaart Studio for all of our wedding stationery and design: save the date, welcome party and wedding invitation, notes at the tables and thank you cards. 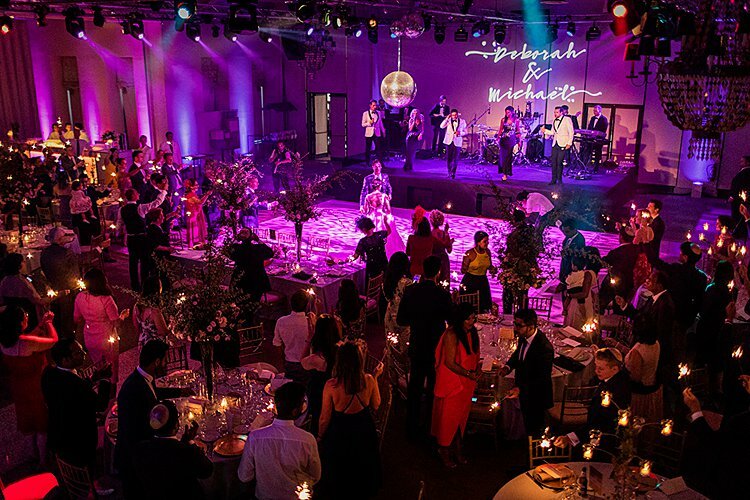 All of these invitations followed the same style with a “Deborah & Michael” logo, which we used throughout the event and had projected behind our band. We wanted our designs to be minimalistic, simplistic and modern but classic and we had a crescendo effect throughout our stationery so that our main invitation was in rose gold and pressed. 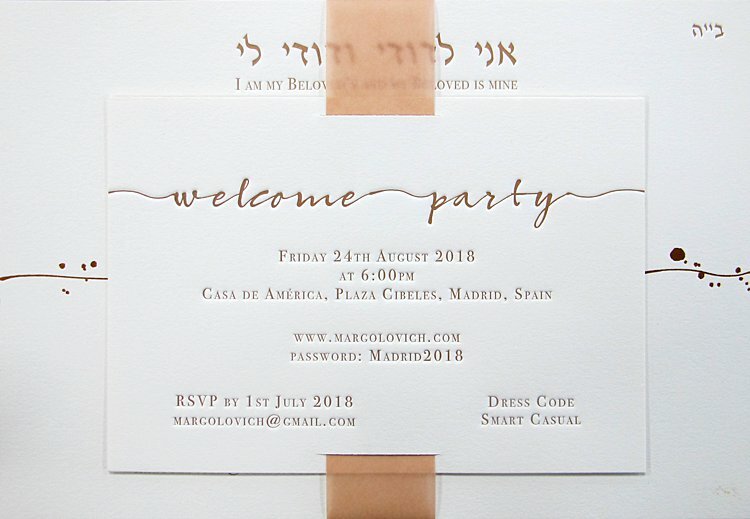 It was important to us to include and remember those parents that are no longer with us in the invitation (Michael’s mother and Deborah’s father) so we ensured that we included both of their names on the invitation and thought about lots of ways to remember them throughout our wedding. 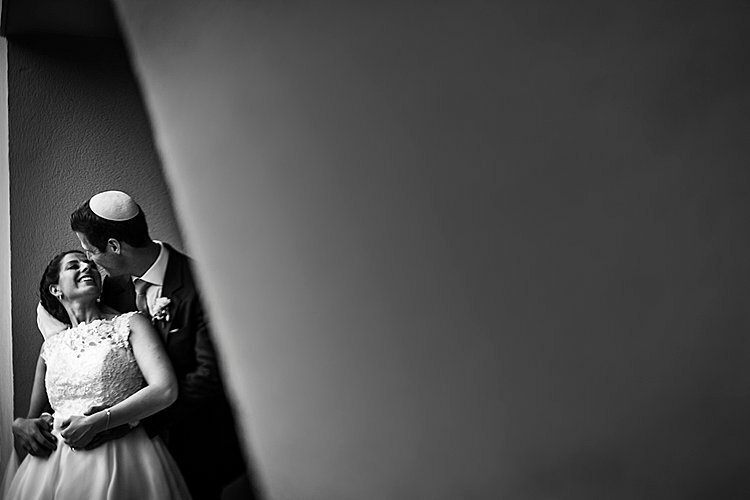 Our wedding email address (and informal hashtag) was a combination of our surnames. Our table designs were of notable places in Madrid and London which a friend of Deborah’s (Lauren Stallard Designs) sketched by hand and then transposed onto a copper sign for each table. 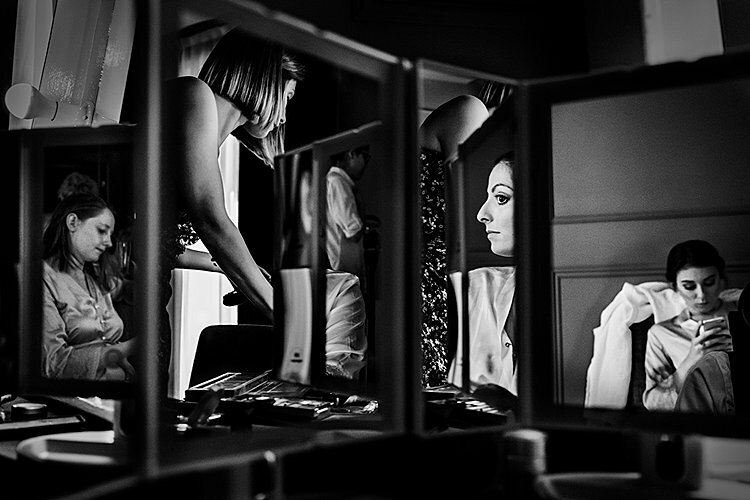 On the day, the bridal party had their hair and makeup done by recommendations from a Madrid beauty salon. 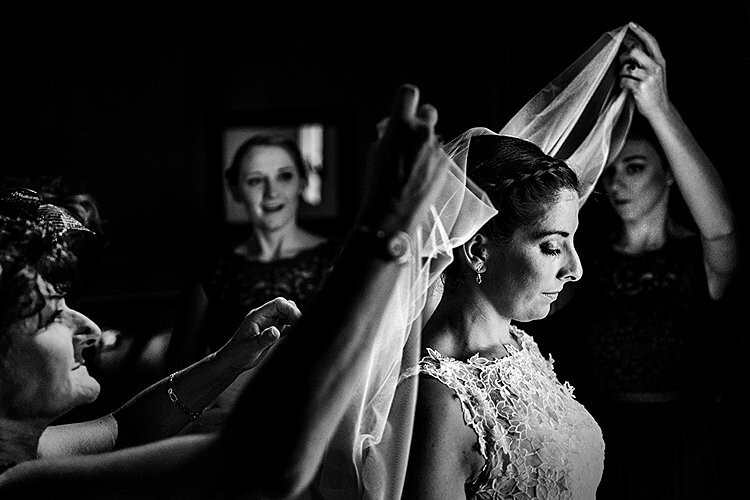 Deborah’s hair was loosely plaited and pinned and she wanted fairly natural makeup and nothing too heavy. For the ceremony, Deborah wore a lightly tinted Dior lip gloss, and changed it for a brighter pink MAC lipstick for the party. Luckily for the pockets in Deborah’s dress, she had somewhere to keep her lipstick for touch ups later in the night! 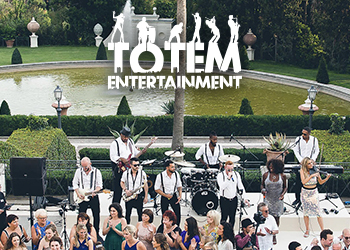 We stayed and got ready in Hotel Totem (a stylish boutique hotel in the trendy Salamanca area of Madrid), who went above and beyond accommodating our planning and accommodating our guests. The hotel had some beautiful staircases which produced some great photos and a really stylish bar for guests to relax in the evenings. 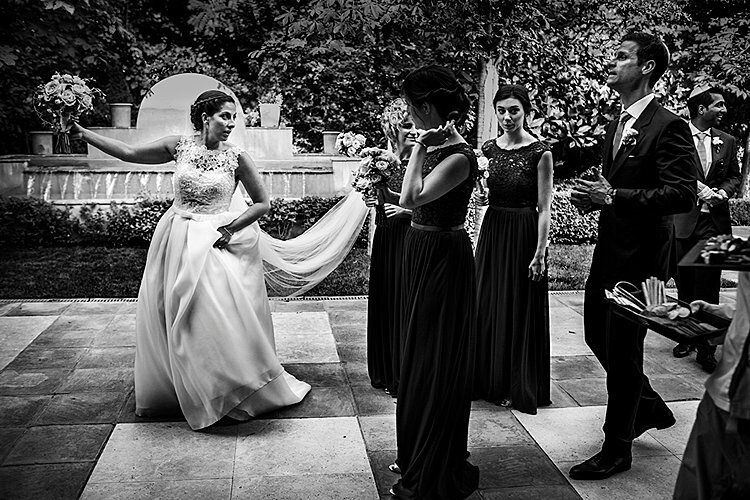 My wedding dress was from the Pronovias flagship store in Madrid. I had a few appointments lined up in London but took the opportunity a few months into our engagement whilst in Madrid with some girlfriends to make a first visit to Pronovias. My intention was to be open minded and to try on a variety of different styles as didn’t really know what I wanted, but I found “the one” on my first visit! It was a princess style with an illusion sweetheart neckline and a low back. It had beautiful detail at the top, a bow at the waist and most importantly pockets! It was love at first sight and I made a decision there and then! 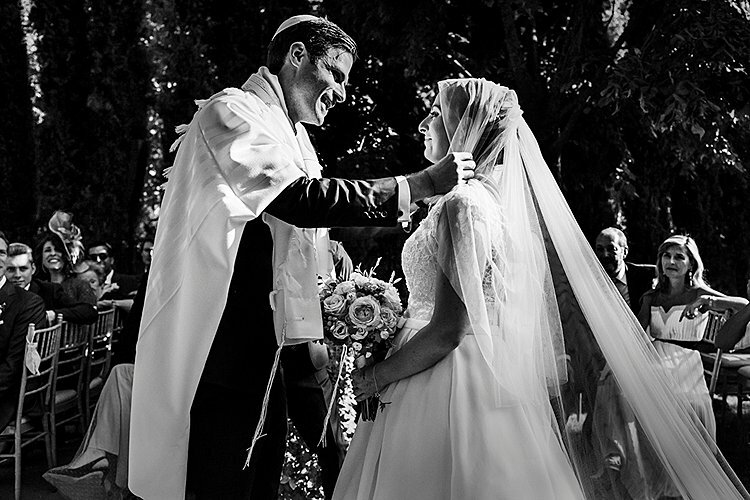 I wore a long veil (also from Pronovias) during the ceremony. 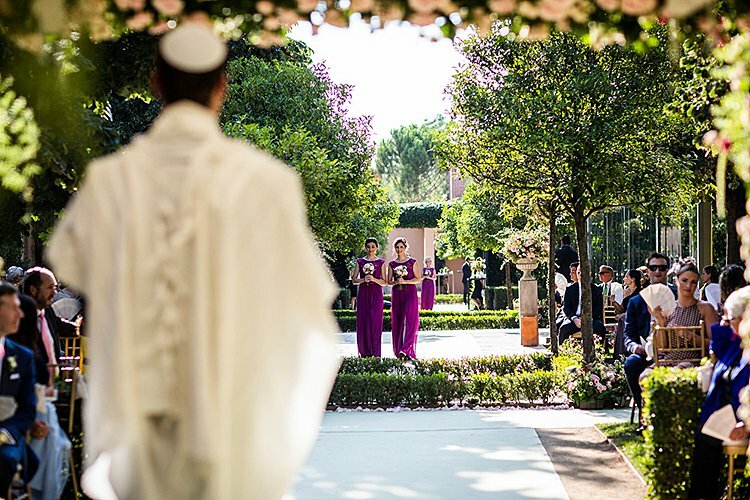 I removed the veil before the entrance into the reception and it then revealed an elegant jewelled headpiece from Pronovias. I wore a special pair of my mum’s earrings and a delicate Tiffany bracelet with a star of David that Michael bought for my 21st birthday. I wore glittery (platinum ice) Jimmy Choo Romy 85 heels. I wore them in before when practising our first dance and they were surprisingly comfortable on the night! For later in the night once the party started, I changed into some Kate Spade KEDS for leading the way on the dance floor until the early hours. Despite his Spanish roots (Deborah always jokes that Michael is the least Spanish person she’s ever met, in terms of way of life! ), Michael chose Gieves & Hawkes, a classic British tailor in Saville Row, to have his three-piece wedding suit made to measure. 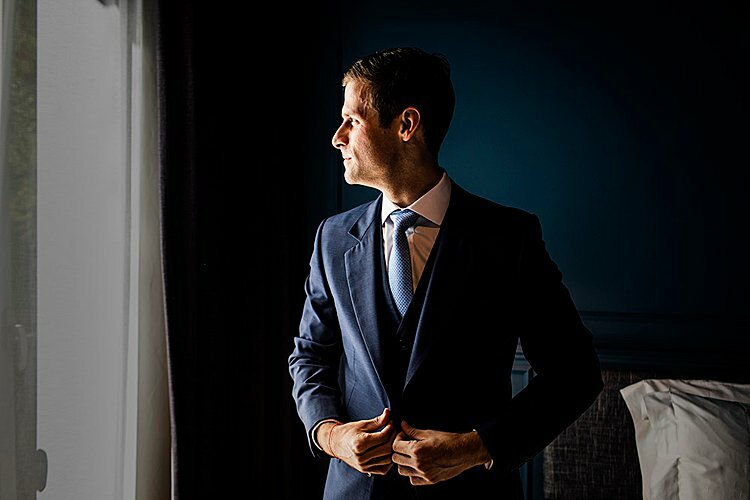 Given the wedding was during the Spanish summer, the choice of colour Michael chose was a deep blue to match the expected blue sky and sunshine! This matched with the groomsmen’s two-piece blue suits (Suit Supply) which was Michael’s ‘best men’ gift for all their help and support on the big day as well as the run up months to the wedding. Other accessories also resonated with British iconic brands as well as international classical: white shirt from Thomas Pink, black shoes from Crockett & Jones at Jermyn Street, a matching blue patterned tie from Hermes and a classic timepiece watch from Jaeger-LeCoultre. The Montblanc cuff links Michael wore on the day were a special gift he received from Deborah on the wedding day. 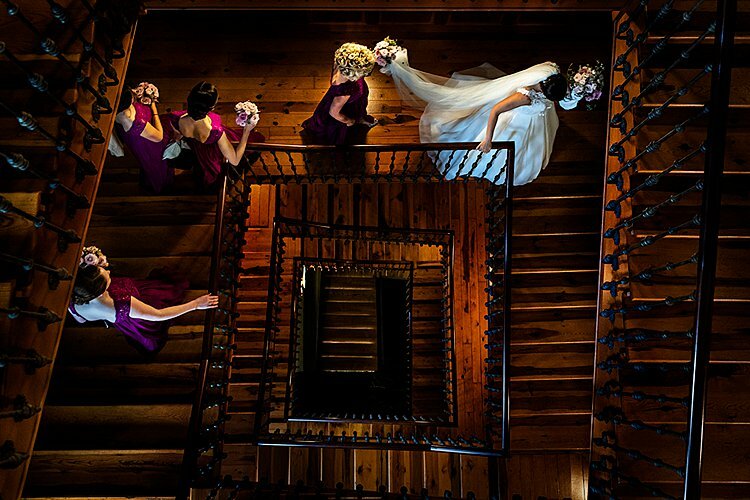 I had four bridesmaids (my sister and three best friends from University) and they all wore matching floor length raspberry dresses from David’s Bridal, which were all altered to fit them perfectly. This colour was in line with the theme. Since the ceremony was outside and in the summer, I wanted a bright colour to stand out. We looked at a few different chuppah designs online and we quickly agreed that we wanted it to be floral and to include roses. 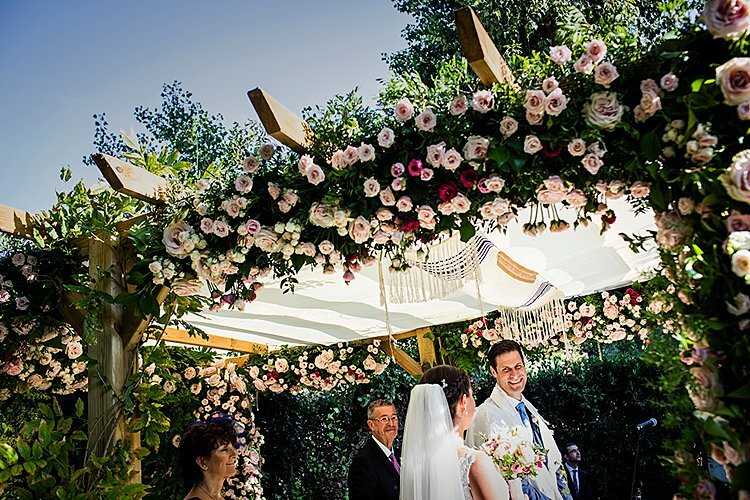 We worked closely with our florists, Bourguignon Floristas to decide on the theme and they worked tirelessly during the whole day to prepare the chuppah and to keep the flowers safe from the sun! 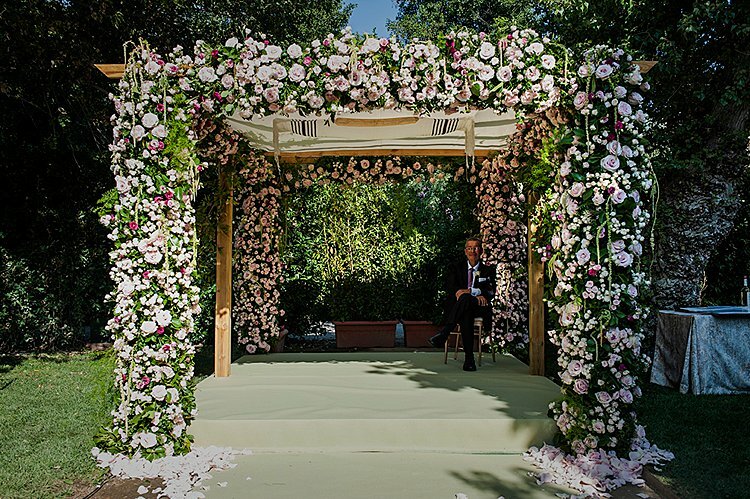 The chuppah contained a total of 1,500 roses and around 2,000 stems of flowers in total! Bourguignon Floristas really went the extra mile with our chuppah and even sent us a video of how our chuppah was prepared during the day and gave us a beautiful watercolour painting of the chuppah they had designed for us as a gift. 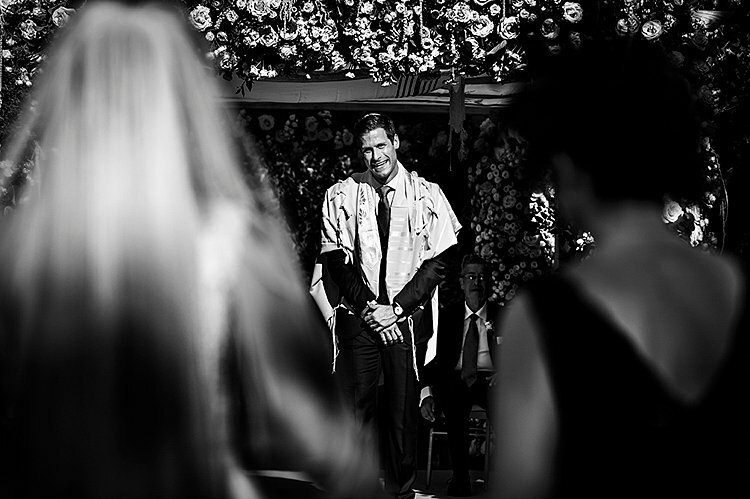 It was important to us to remember Deborah’s father who passed away and we decided to incorporate his tallit into the chuppah design. This was an idea that we had got from STG! 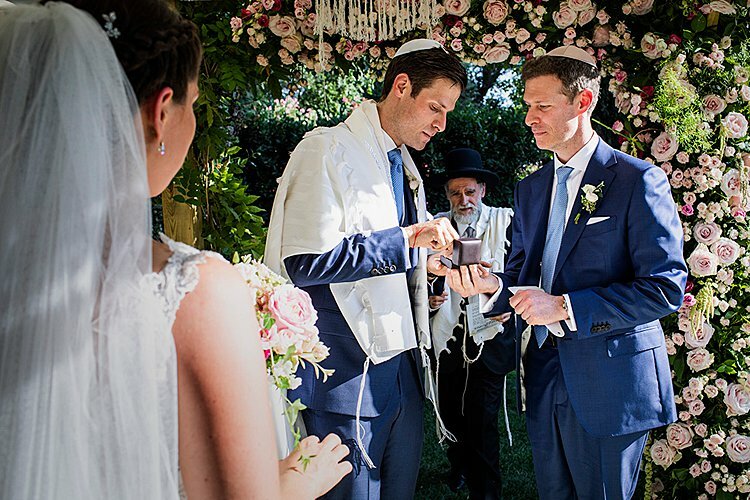 For a lot of our non-Jewish friends, this was their first chuppah ceremony and we wanted to ensure that they were part of it and could understand the religious ceremony, the traditions and the significance. 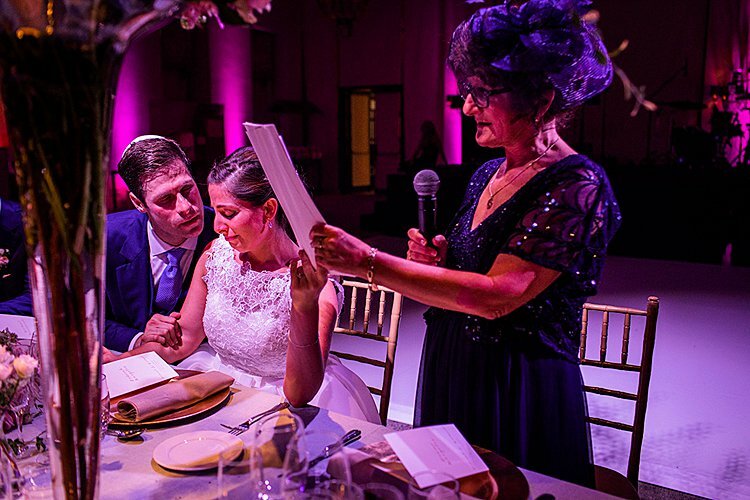 Our explanatory document for the chuppah doubled up as a fan as the ceremony took place outside during August in the early evening and it was quite warm. 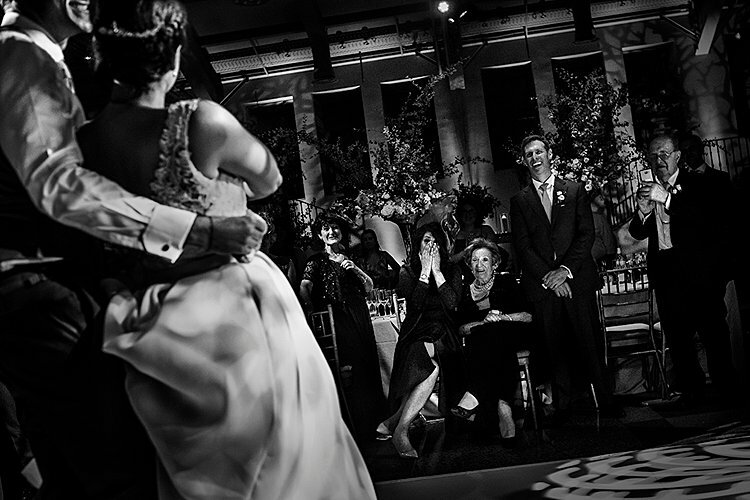 Our ceremony was extremely emotional: Michael’s mother passed away when he was young, and Deborah’s father passed away a few years ago, so as much as it was a happy occasion, we included a lot of elements to include those that could not be with us. 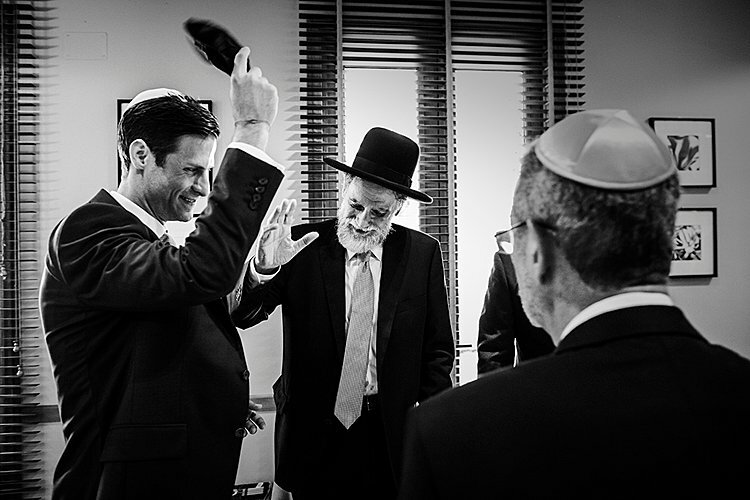 We had two rabbis at our ceremony: Rabbi Moshe Bendahan, who is the Chief Rabbi of Spain, and who has known Michael’s family for twenty years, and Rabbi Andrew Savage, who Deborah and Michael have known for many years (from when he used to live in London), who made the trip especially from Berlin. 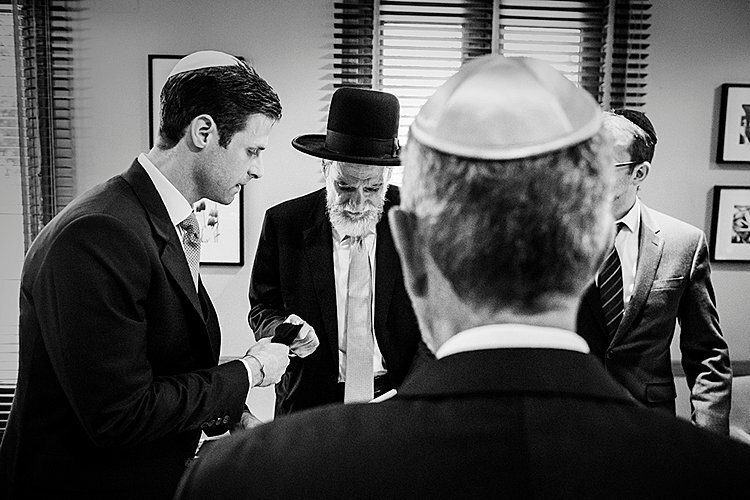 Both rabbis said a few words, which were extremely touching, personal and moving. 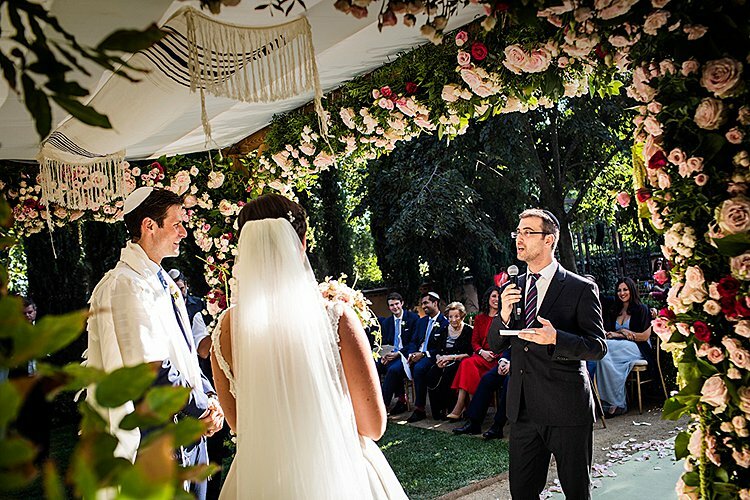 The languages of the ceremony were English and Hebrew, and when Rabbi Bendahan spoke in Spanish we also prepared an English translation. 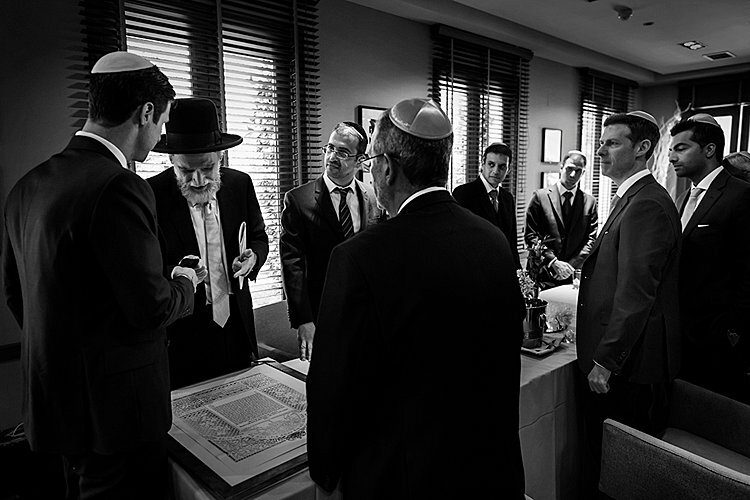 Our ketubah was a beautiful design by Danny Azoulay of Jerusalem Vineyards, which was particularly meaningful as we met on Birthright in Jerusalem. It was a paper cut gold leaf chuppah and a very special artwork which we look forward to hanging in our home together. 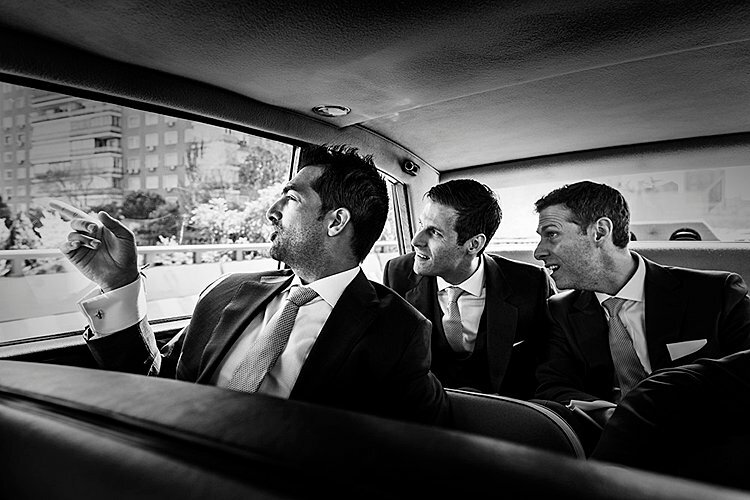 Groom’s entrance music was ‘Mehera’ to the tune of Louis Armstrong’s ‘What a Wonderful World’. 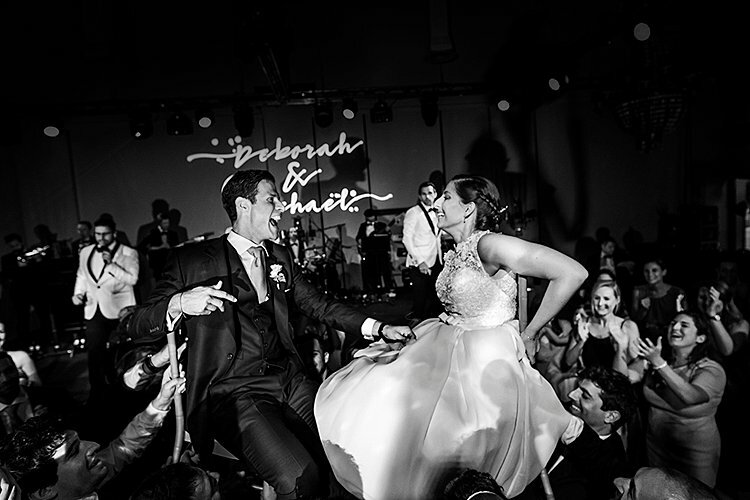 Bridal party entrance music was ‘Lecha Dodi’ to the tune of John Legend’s ‘All of Me’. This was the song that originally drew us to Muzika so we were really pleased to be able to have them play this for us! Entrance into dinner was a Gatsby style ‘A Little Party Never Killed Nobody’ by the Black Eyed Peas and set the right mood for the rest of the evening! The bridal bouquet was made up of “Keira” English Roses, “Kristal Kate-Lynn” Spray Roses, “Million Stars” white Astrantia, White Phox, Silver Brunia. Raspberry Lisianthus. The bridemaids’ bouquet was a similar to the bridal bouquet but smaller and was made up of “Sweet Avalanche” Roses, “Keira” English Roses, Spray Roses, Silver Brunia. Pink Lisianthus and “Million Stars” Astrantia. 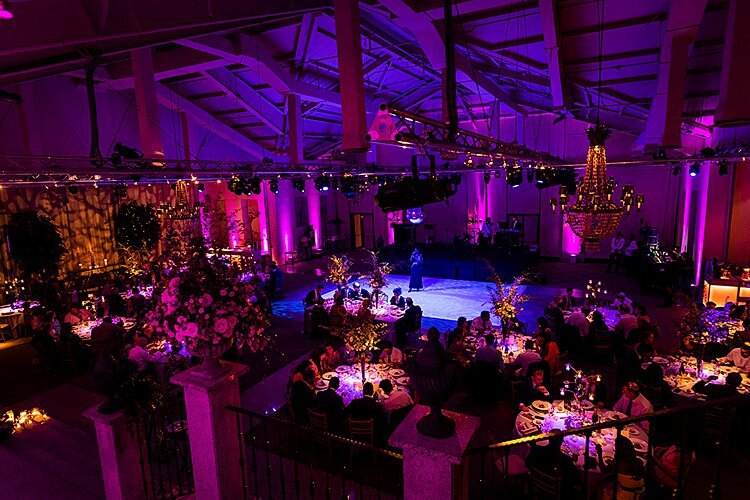 The room where our dinner was held had a really high ceiling and so we mixed tall centre pieces (3 metres high!) with smaller ones, both of which contained roses. 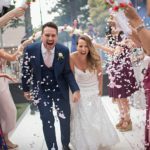 Overall over 2,400 roses were used at our wedding! 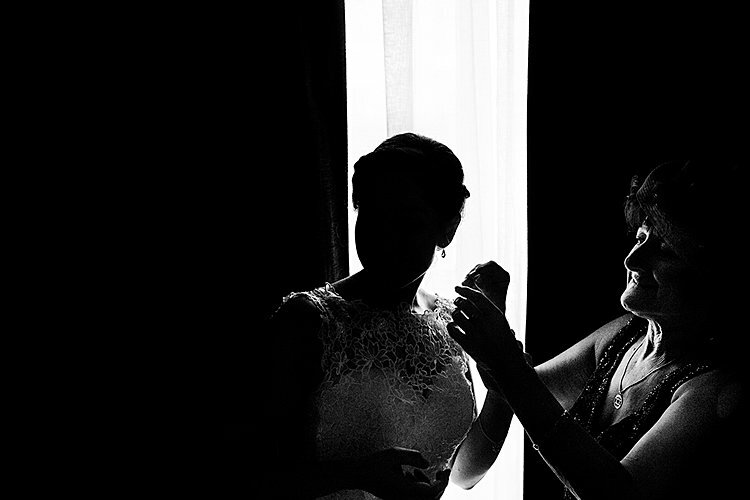 We used Victor Lax to capture our wedding day. 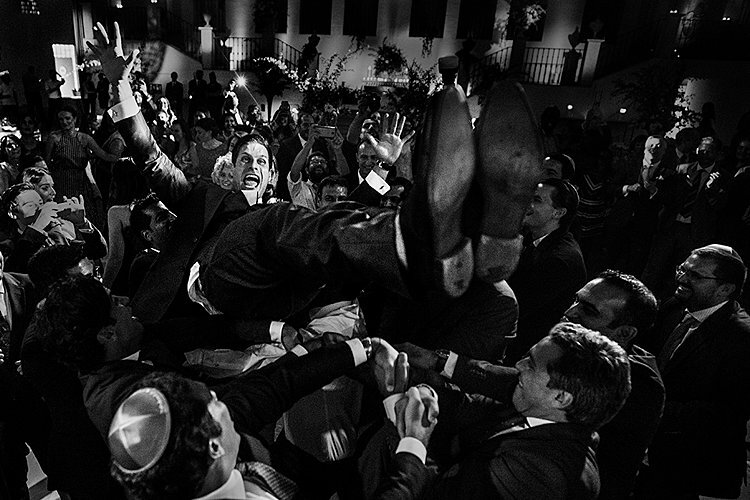 Victor is a renowned international, award winning Spanish photographer based in Spain, who was incredible and really captured all of the emotions of the day! We first met Victor in London when he was travelling in the UK and we got on really well with him and were extremely impressed by his work and how humble he was. 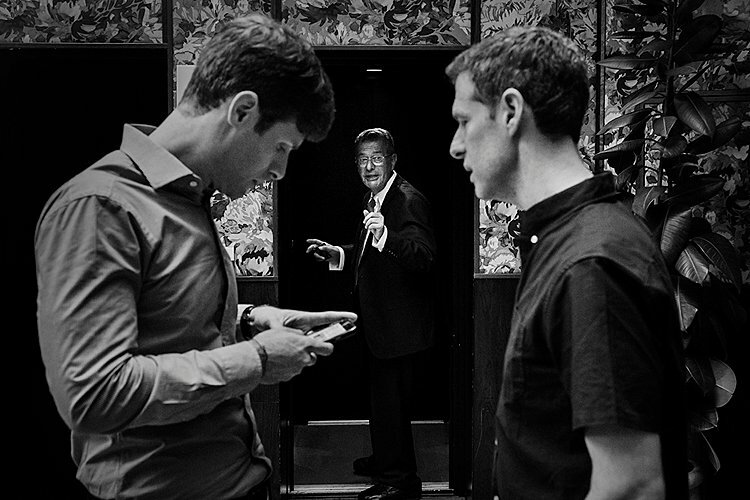 We both felt really comfortable around him and he and his team were great to work with. We also had a videographer (Al Agua) who do a lot of cinematic videos. The short video we received really captures the energy of the day. 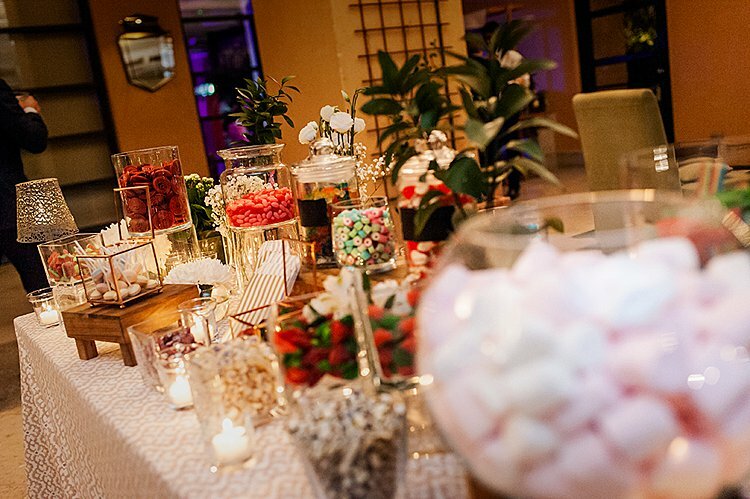 We decided not to have a wedding cake and instead had a sweets and candy bar outside later in the night, with cupcakes, sweet treats, chocolate fountain and macaroons. We also had some personalised sweets from Pappa Bubble (a sweet manufacturer in Tel Aviv) which used our initials and were pink in line with the colour theme! We also had a whisky and cigar bar outside by the candy bar, for guests to enjoy outside when they were taking a break from the dance floor. 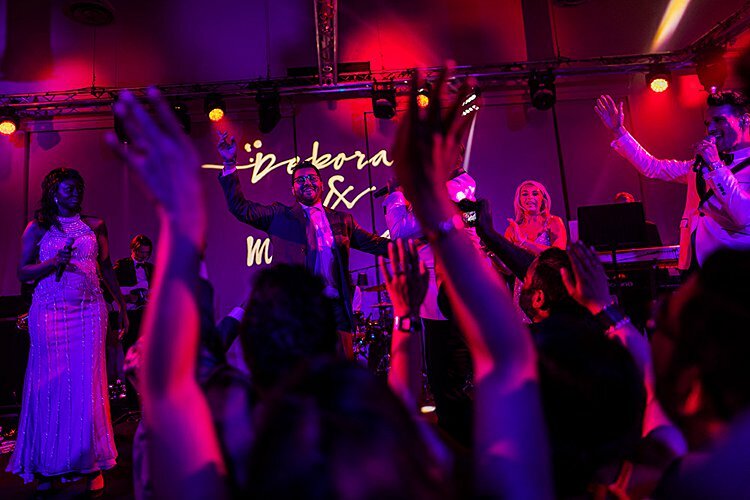 Since the party continued until sunrise we had “recena” (which is roughly translated as “second dinner”) in the early hours to give our guests the energy to keep going. We wanted to give it a combination of a Spanish and British touch, so we served fish and chips and chocolate con churros to continue the theme of combining cultures. 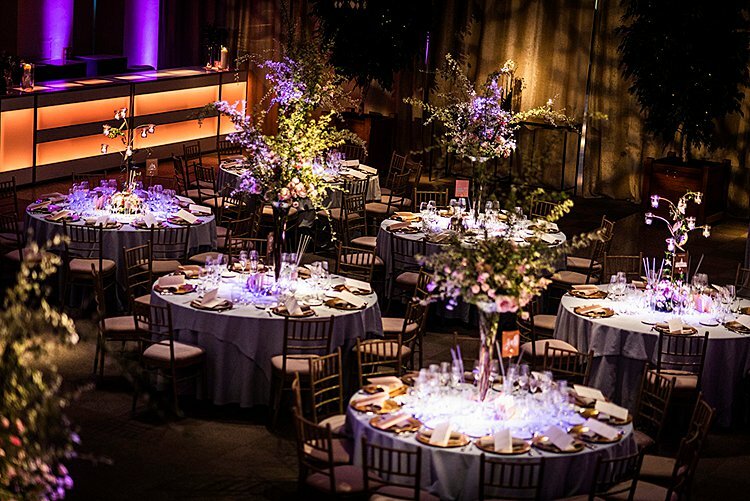 All of our catering was taken care of by the venue – and they did an excellent job! 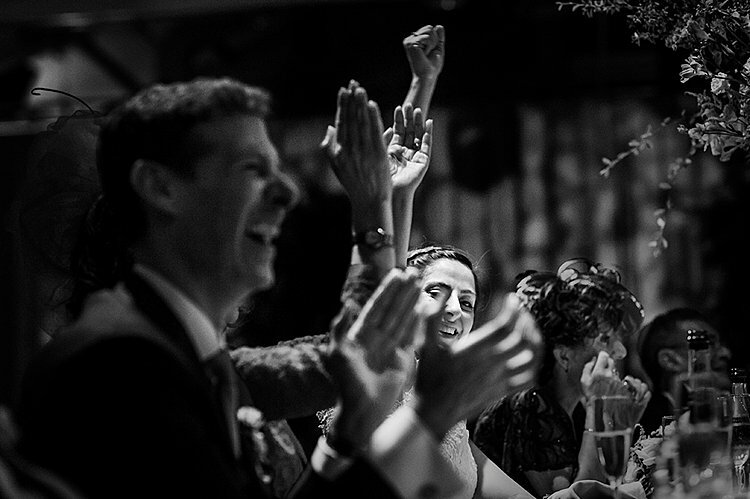 Our wedding band were Muzika (who as I’m sure you already know are incredible!) and gave a real energy to the party! 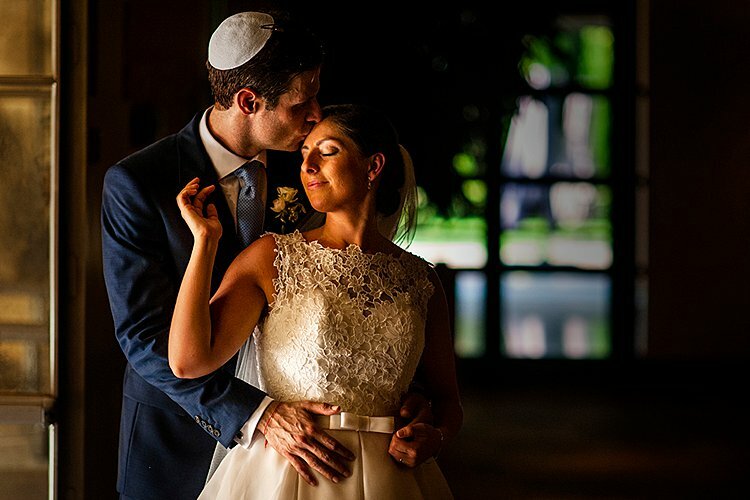 We met with Muzika several times in the run up to our wedding to discuss all of the finer details of the music throughout our wedding. We had heard countless positive recommendations from friends and they did not disappoint! 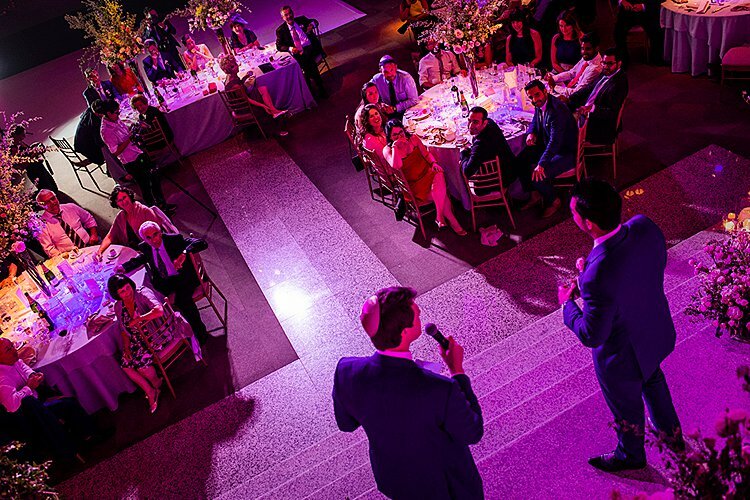 On the night their performance was just incredible and we particularly enjoyed how they interacted with our guests to ensure that everybody had a great time! We had a photobooth at the wedding with fridge magnet souvenirs (with the Deborah & Michael logo, of course!) which was really well received. We also got a book with all of the photos which was a great way for us to re-live the whole night! One of the most unusual things we had was a glitter face paint bar for the party (Deborah insisted! ), which was a bit different and which went down really well in the early hours of the party! With the help of Kaart, at the end of the night our guests took home hangover kits, which were positioned under a sign that said “Fiesta, Siesta, Repeat” (complete with the “Deborah & Michael” logo and the slogan “in sickness and in health”. The hangover kit contained “Coral” sunglasses (pink for the women, black for the men), a bottle of water, vitamin sweets, coffee sachets, liquid painkiller and an energy bar). We got a lot of photos the next day from our guests demonstrating that they were making good use of the kits. We also had personalised “love themed” sweet jars for guests to take home at the end of the night. 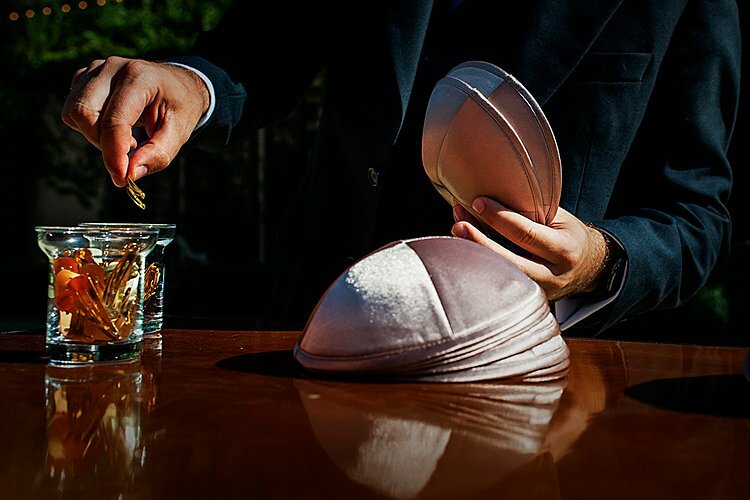 Michael found a kosher supplier in Tel Aviv called Papa Bubble and we called in favours from family to bring them to Madrid. 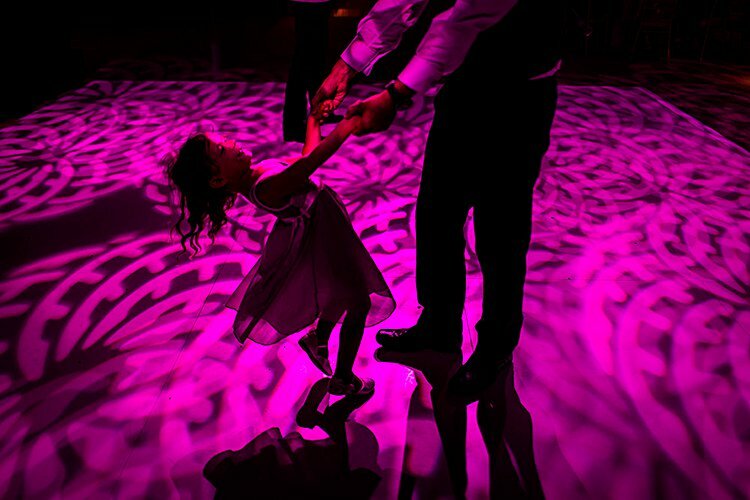 We had gold dancing shoes for guests to ensure that they could remain on the dance floor until the early hours. We arrived at the venue separately with classic cars. Deborah arrived in a Rolls Royce Silver Cloud MK1 with her mum and sister and Michael arrived in a Jaguar Daimler Limo with his groomsmen. As a lot of our guests had travelled a long way to be with us, in order to get the party started and to help friends and family get to know each other, we had a welcome party on the Friday night at the terrace at Casa de América (the Latin American culture centre in Madrid and part of a very grand building!). 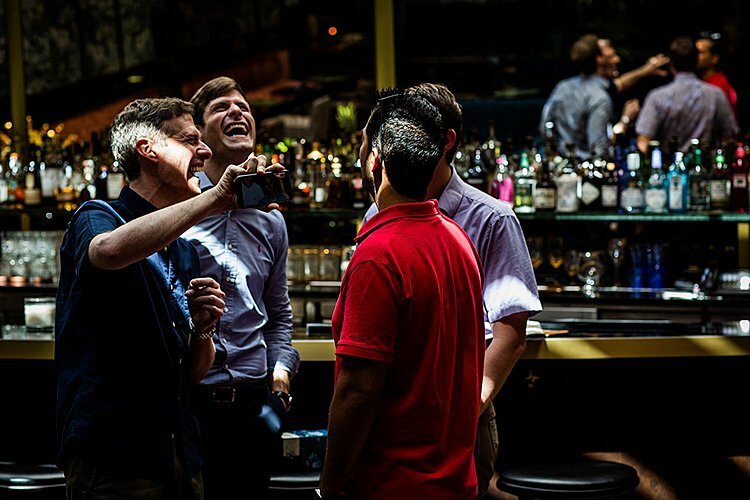 The party was an informal Spanish-style cocktail party with drinks, canapes and small plates and shisha later in the night. It was also a great opportunity for us to catch up with our friends and family in a relaxed setting ahead of the big day. We had personalised handwritten notes on each table (all with our matching wedding stationery!) to thank them individually for coming to our wedding and to show our gratitude for their attendance. It was also a great opportunity for us to thank our closest friends and family for being a part of our special day and for us to tell them what they mean to us. A lot of our guests told us that they found this really touching. 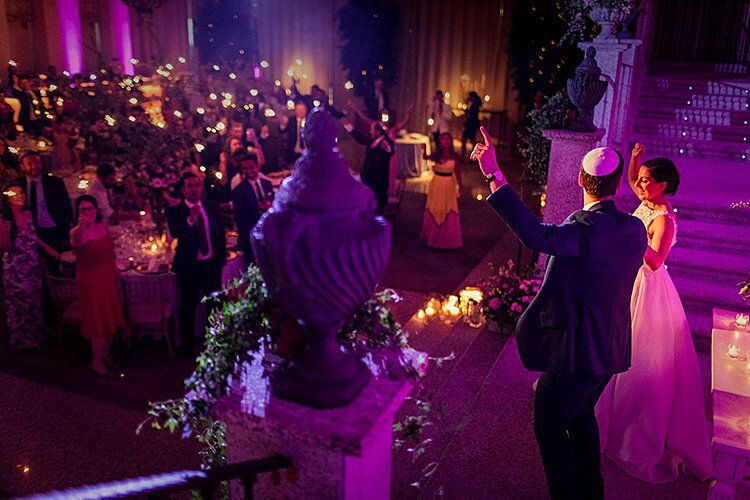 Our guests lit sparklers (which were placed in a vase on each table with the slogan “Let Love Sparkle”) and the lights were dimmed as we entered the room down the stairs to Muzika playing ‘A Little Party Never Killed Nobody’. 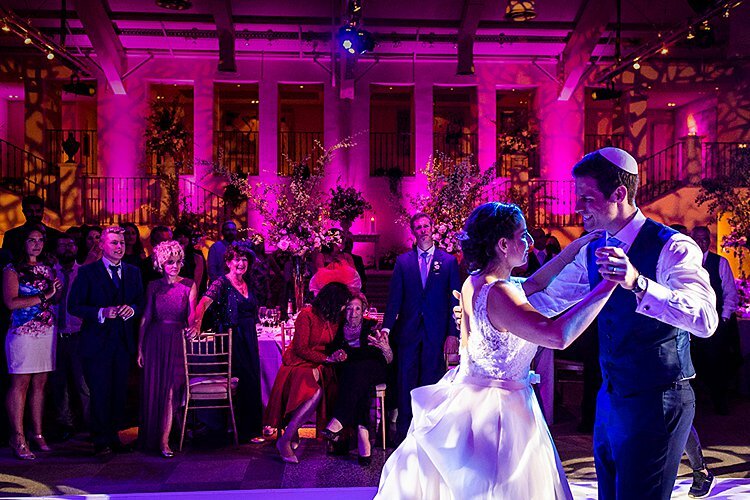 It was a really beautiful moment as the lights went down and all of our guests were waving their sparklers in the air! In true Spanish style, our party went on until 5am and we had a “survivors” photo at 5am with all of those that made it to the end (which is reminiscent of the balls in Cambridge where Deborah studied). 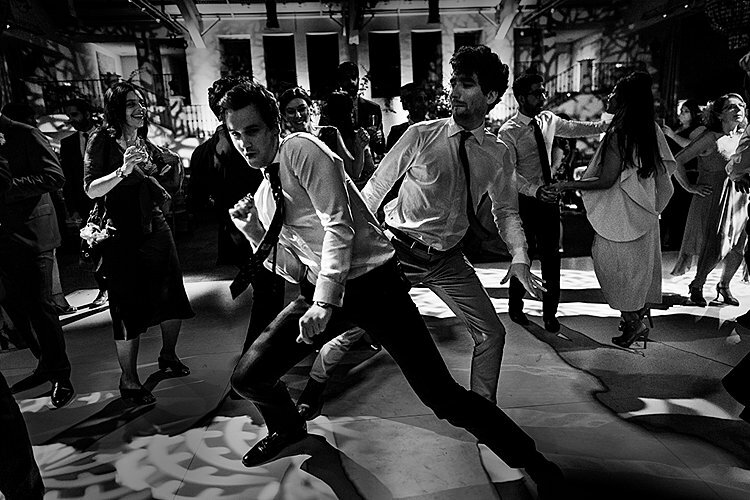 We had an “hora loca” in the early hours which added an energy boost to the party. 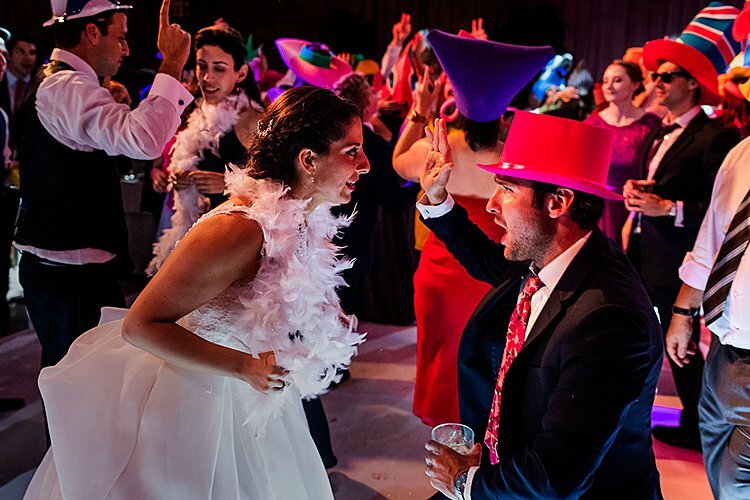 At the beginning of hora loca oversized hats and props were brought out to get people onto the dance floor with Muzika playing after the sugar rush from the candy bar kicked in! We stayed in Madrid for a few days after the wedding to spend time with our families and we then went to Sorrento, Italy for a few days for a minimoon. We went on honeymoon in December/January. We stayed one week at the Oberoi in Mauritius over New Year’s and then almost 3 weeks in South Africa (was absolutely amazing!). 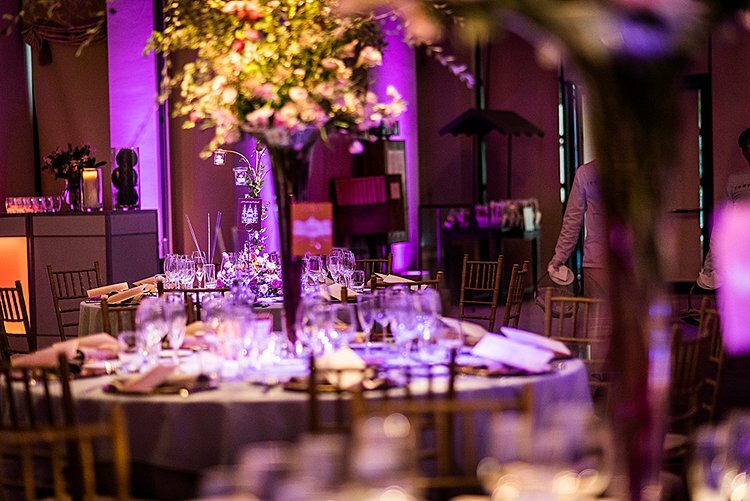 We worked closely with Eric, our wedding planner, who was a true professional, and that ensured that we had nothing to worry about on the day. 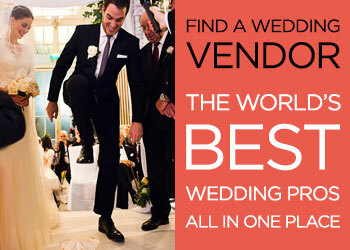 For us, an expert wedding planner was key when organising a destination wedding. Preparation was key, we had quite a long engagement and we tried to front-load as much as possible, although we appreciate that it’s always easier said than done! Work with suppliers that you really trust and “connect” with! 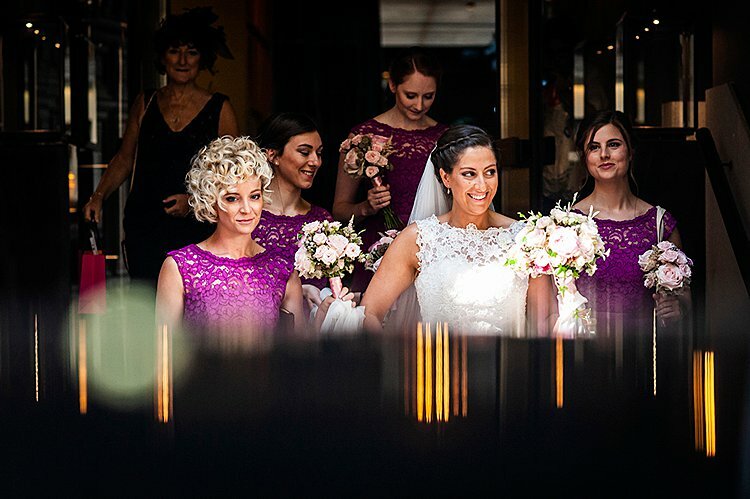 We were really lucky with all of our suppliers and built close connections with all of them and they were all really keen to do an outstanding job for us and go the extra mile. Some of them had a personal connection with us and others were referrals.